Here’s how to stay well through the hustle and bustle of the season. Get properly stoked for holiday parties. To avoid eating something you shouldn’t and feeling awful, fuel up on food that you know is safe. Either bring your own gluten-free dish to the party, or if you can’t, eat a sustaining mini-meal beforehand. The mayor of the Big Island of Hawaii has signed a bill into law that bans all future plantings of genetically modified organisms (GMOs) and prohibits biotech companies from operating on the Big Island. In a letter to council members announcing his decision to sign the bill, Mayor Billy Kenoi said that the new law signals the county’s desire to encourage community-based farming and ranching, as opposed to playing host to global agribusiness corporations. 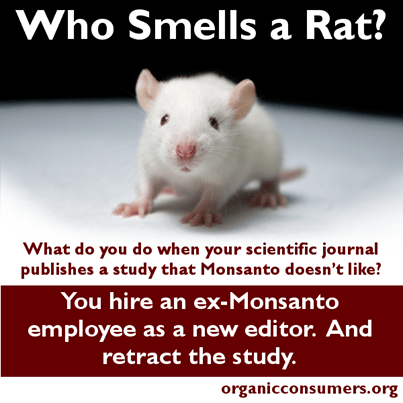 The widely circulated study linking genetically modified corn to an increased rate of organ damage, tumors, and premature death in lab rats, about which I and many others have written and spoken, has been officially retracted by the journal that published it. A retraction of a study in a journal rarely happens and, when it does, it normally indicates there was some type of fraud or misrepresentation of data by the authors. In this case, the publishers explained that the authors had not committed any mistakes or deliberate deception, just that the results do not reach the threshold of publication for Food and Chemical Toxicology (FCT). So, is there more to know about the retraction? Yes, this important detail: The study was retracted from FCT less than a year after the journal appointed Richard E. Goodman, an ex-employee of genetically modified seed giant Monsanto, as the editor tasked with reviewing its biotechnology papers. The study that was retracted evaluated the effects of Monsanto’s patented corn NK603 and its patented herbicide Roundup. Any time of year, but especially during the holiday season when we can encounter candies, cookies, and sweet drinks at every turn, it’s important to be reminded that sugar is toxic to our health, whether it’s genetically modified or not. I am continually surprised how many people who are trying to avoid genetically modified foods or gluten to protect their health, regularly choose foods and beverages sweetened with cane sugar or evaporated cane juice, not realizing the long-term damage sugar does to health. Time for a quick review. First, sugar is an immunosuppressant. We knew that long before genetically modified white sugar was put on the market. As I explained in Going Against the Grain, sugar not only reduces the ability of white blood cells to track and attack bacteria but also reduces the production of antibodies, which protect against viruses and other invaders. That’s critical information to remember in the heart of cold and flu season.